Time Stretch, Time Warp, Timesifter, Extra Turnpocalypse… that last one is made up, but the fact remains that everyone wants more turns. 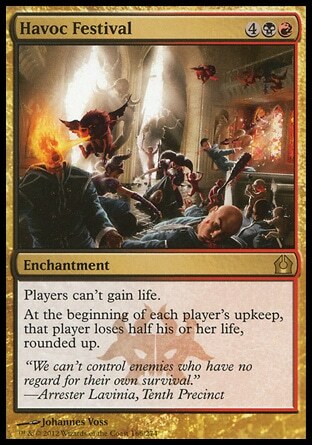 The extra turn mechanic has certainly become a staple in commander. 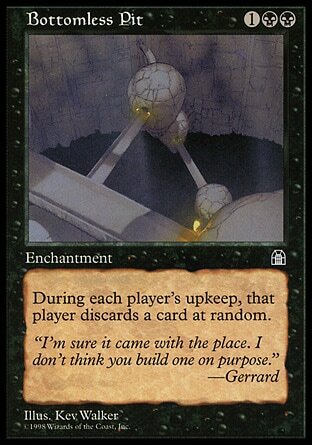 Why wait for other people to durdle around searching their libraries and shuffling and casting spells, when you could be the one taking all of the turns? Because it’s expected, that’s why! This week I explore the potential to win a game by taking NONE of the turns. I’m going to christen this deck the Time Vampire. It just drinks up all of your turns then runs off to make a terrible teenage romance movie. This is a deck based around cards that let you skip your own turn. Try-hards should look away now, because viewing this deck is going to be like the sun rising on a vampire, a Time Vampire. 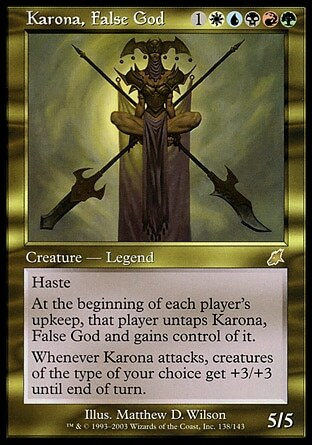 For this list I have chosen Karona, False God as the general. Horde of Notions could also work as an alternate general for this deck since it allows you to cast creatures during other players turns. We are going to need access to all five colors for this build. Additionally, Karona sluts it up and makes her way around the table even when it isn’t your turn. Even if you skip your turn, your general is likely going to be swinging at someone. Hopefully that someone isn’t you. 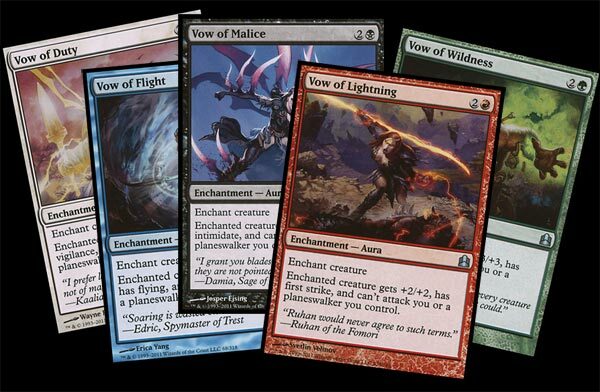 That is why we are also going to be adding the Vow cycle from the commander precons as well. That allows Karona to get beefed up and focus her rage on someone other than you. Next up, let’s take a look at the cards which will allow us to skip turns. 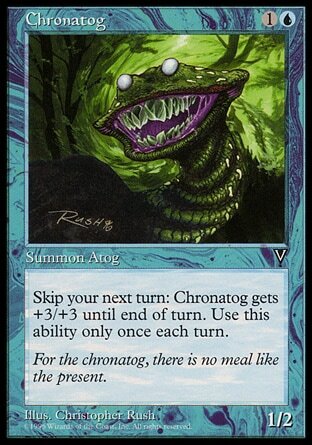 Chronatog – The Chronatog is a key piece to this deck, since it allows you to skip all of your turns for free without ever actually having to take a turn. Old schooler players may remember him for the Chrono-Stasis decks of old. 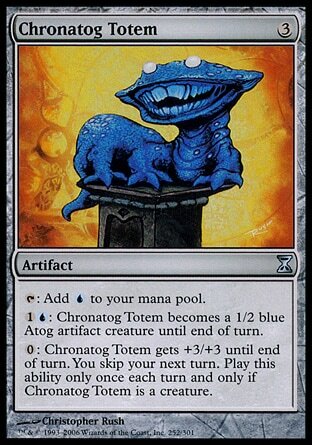 Chronatog Totem – Not as good as the original Chronatog but it it does provide you with some turn skipping redundancy. 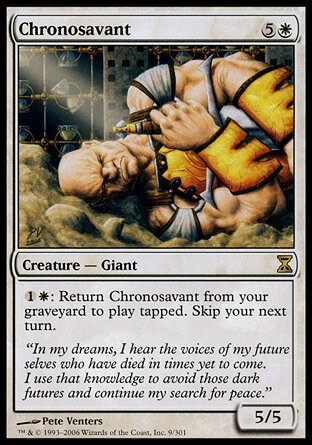 Chronosavant – He most likely won’t be able to let you skip turns with a lot of consistency, but he does provide a pretty decent sized body that you can used for blocking and skipping turns. 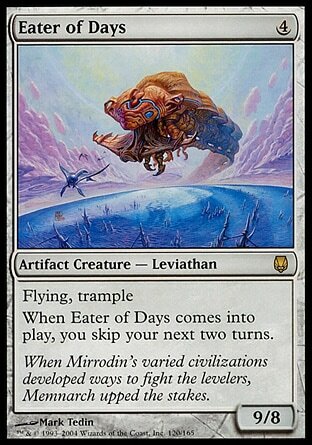 Eater of Days – This guy is so hungry he eats two turns at a time. Don’t worry, if you actually do need to take a turn you have a 9/8 flying trampler at your disposal. He snacks on Time Stretches for brunch. 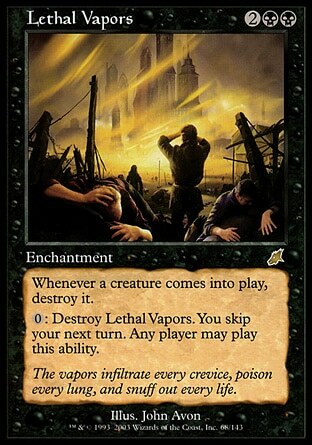 Lethal Vapors – This card serves a dual purpose, it can temporarily lock down the board or serve as a one-off turn skipping outlet. 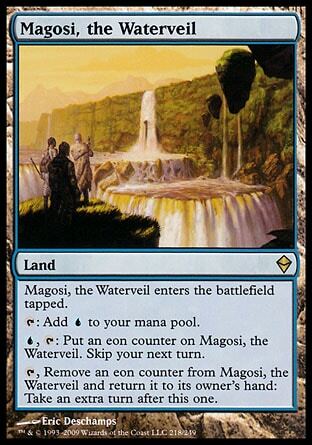 Magosi, the Waterveil – Magosi is going to let you skip at least every other turn consistently. It has the added bonus of giving you an extra turn if you need to finish someone off with Karona, Eater of Days, etc. 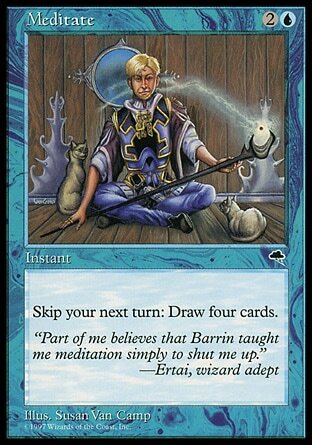 Meditate – Four cards for 3 mana is great value at instant speed, plus it eats up another one of our turns. I remember when this was the hottest card in Tempest at one time. (Wasteland laughs in the background). 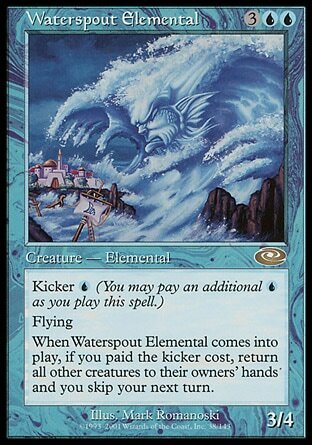 Waterspout Elemental – This card also serves a dual purpose. You get all of those pesky creatures off the table and you get to skip a turn. 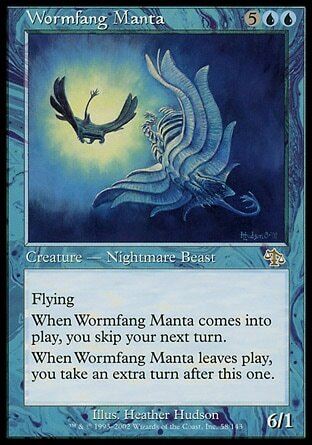 Wormfang Manta – With the manta we get a decent sized body and another way to skip a turn. It’s pretty fragile, so it will die to just about anything. The extra turn may or may not be a welcomed bonus so I’m not sure this card will make the final cut. It’s hard to abuse the card with flicker or bounce effect as well since the two triggers nullify each other. 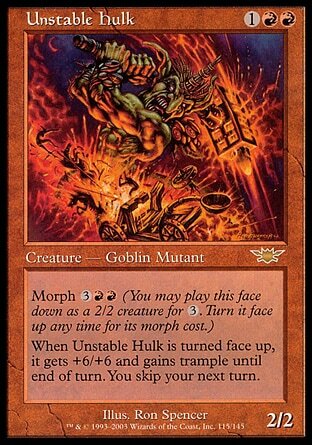 Unstable hulk – An 8 mana investment to skip a turn is pretty steep. It also has no way of really being abused unless we want to start throwing in morph twiddling effects, which I don’t. 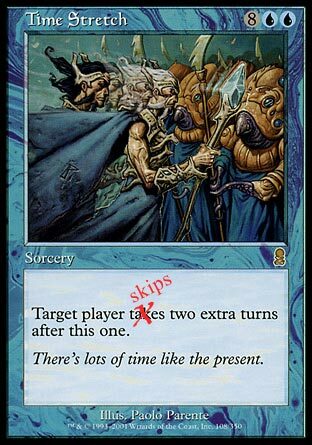 Also does using a card to skip even more turns considering abuse? Now that we have some ways to skip turns, which cards help us win when we don’t have to take our turn? These are pretty critical to actually trying to win and not just skipping your turns and looking like you’ve lost your mind. Havoc Festival – This card is going to be your primary way to win in most games. People will be losing big chunks of life while you sit back, pull out your smartphone and read my articles. 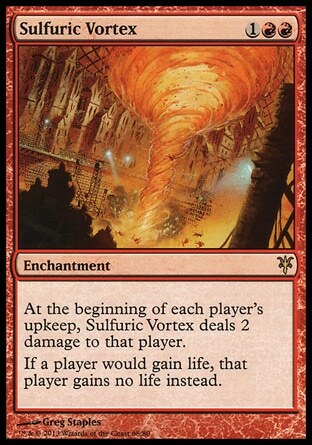 Sulfuric Vortex – Another way to slowly whittle down opponents life totals. The player’s can’t gain life clause is clutch as well. Bottomless Pit / Necrogen Mists – Get all “300” on your opponents by kicking them down into a giant frickin’ pit. 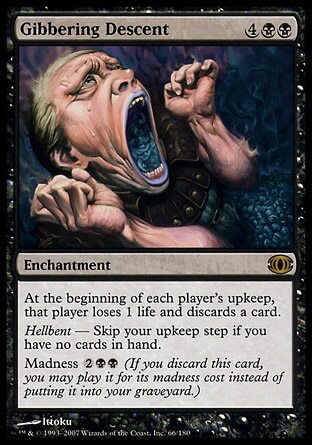 Gibbering Descent – Your opponents will be gibbering when they are pitching cards every turn and losing life. Things really get kicked into high gear if you have no cards in hand. Your upkeep is the specific part of your turn that we want to be skipping. 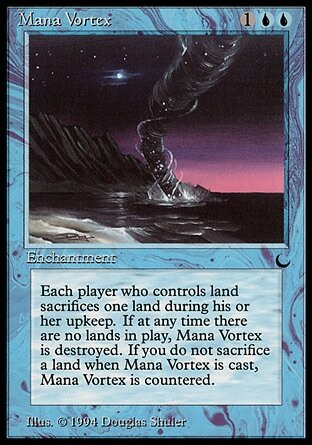 Mana Vortex – Watch your opponents lands whittle away while you sit upon your Chronatog Totem throne and plot your victory. 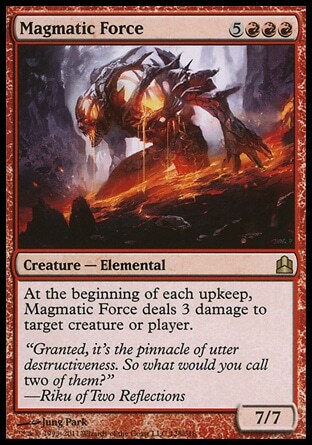 Magmatic Force – He’s pretty expensive, but he does go on cruise control pinging someone or something for 3 damage during each turn. He’s a pretty beefy blocker too while you sit out for a few turns. Karma – We will be running Urborg in this list, so swamp Karma can really swamp get the party going for the swamp owners out there. 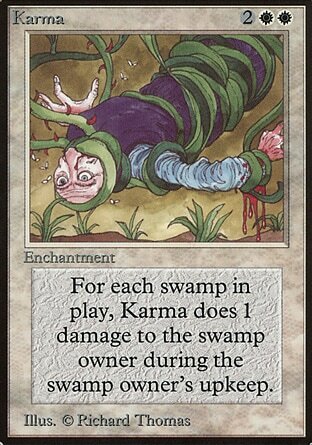 Swamp. 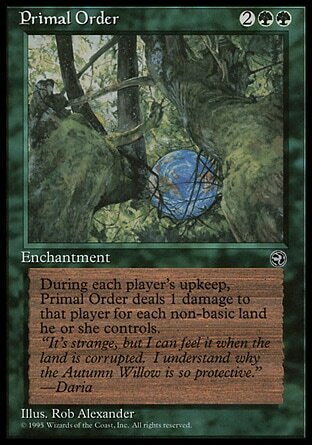 Primal Order – It’s Homelands tech! Punish your opponents for their audacity to actually take their turns and play lands. I’ll have the rest of the card selections as well as a final deck list. Don’t worry, next week is just a few skipped turns away.